Happy Hump Day, fellow book lovers. I usually post a Writing Wednesday post here, but today I wanted to do something different and talk about a new release that’s been getting a lot of buzz. Critics are saying if you’re a fan of The Handmaid’s Tale, this book is the book you should read once you finish the classic tale. It has an intriguing premise, and as of this writing, it’s the #1 New Release on Amazon in Political Thrillers & Suspense, and in the top twenty in dystopian. Are you one of the readers who has been highly anticipating this new release? The Buzz: Vox has garnered praise from Publisher’s Weekly, O Magazine, Entertainment Weekly, SheReads, Good Morning America, Pop Sugar, Refinery29, Vanity Fair, Cosmopolitan, and authors like Lee Child. Erica’s Two Cents: Dystopian isn’t one of my favorite genres. It’s not an automatic add to my TBR pile. However, I don’t limit my reading picks by genre. If a book’s premise is intriguing, I’ll happily venture outside of my go-to genres (this is how I ended up reading Dean Koontz’s False Memory). As someone who would probably suffer whatever consequences come with going over the word limit for women in this world on day one, I’m intrigued to see how women stay within these limits, what happens when they go over the limit, and how Jean challenges this system. 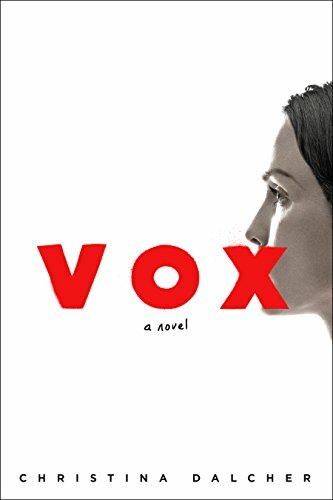 Vox would easily make the list of books I’d recommend to co-contributor Christina, as she’s a fan of The Handmaid’s Tale and the description sounds right up her alley. Perhaps if we ever start a book club or podcast, this would be one of our picks. Are you a fan of dystopian or the Handmaid’s Tale? Are you reading/will you read Vox? Most importantly, would you survive if you could only speak 100 words a day, or would you be as dead as I’d be before 6:00am on Day 1?